The 4 Station Compact Portable Restrooms Trailer Cabo Series offers a compact yet comfortable environment with beautiful earth tone interior. This unique floor plan includes 4 compact unisex suites, each with a separate entrance. Each suite includes 1 pedal-flush, water-saving china flushable toilet, space-saving stainless steel corner sink with solid surface countertop, shatter-proof mirror, metered faucet, and soap and paper towel dispenser and toilet paper holder. Your guests will enjoy the comfort of a fully climate-controlled environment maintained with air conditioning and heat strips! 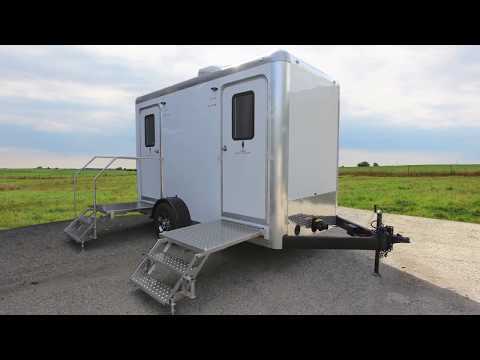 This 4 Station Restroom Trailer would be a wonderful addition to any portable restroom rentals fleet.